Tarumim’s fundamental concern is helping communities build their adaptive capacity as the climate in Brazil becomes more hostile, both in terms of weather and politics. In 2008, Tarumim’s director swam in a beautiful stream in Minas Gerais that has since dried up. Minas Gerais has lost over 90% of its Atlantic forest, and the disruption of the water cycle threatens the whole country, with floods in the north, major shortages in the cities of the south, and impacts around the world. 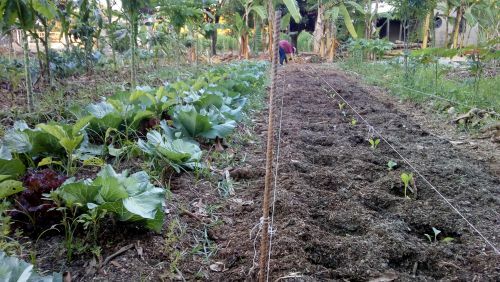 Syntropic farming can regenerate degraded land into bio-diverse agroforestry plots, returning springs to life and increasing rainfall, while its high yields provide food security and employment. There are networks in place, but the system is virtually unheard of in rural Minas Gerais, so Tarumim will channel funds from crowdfunding and businesses into fortifying and scaling these networks. Since Carol Novaes (pictured) qualified as a Syntropic teacher and transitioned from conventional farming to agroforestry, several of the 42 agriculturalists’ projects in her area have also started experimenting. One of Tarumim’s projects is to fund her to hold free workshops and assist agriculturalists in the process of transition, and thereby catalyse a wave of community interest.